On this trips flag football play, line up the receivers on the left side evenly spaced out. The receivers will be in the Wide, Slot, and Tight positions. The read for the quarterback on this play is Deep to Short. The Quarterback’s first read is the Tight Receiver on the Corner route. In the pre-snap, the QB should see what the defense is showing and how they are lined up. If the defense has one safety, then the Corner route may be open. However, if before the snap, the defense is showing a cover 2 (2 safeties) and the safeties are playing wide, the Corner route is no longer a viable option. Depending on how tight the defense is playing the Blue receiver will dictate if the Slot receiver (Green) will be open. If the defense is playing a cover 2 and the cornerback is playing tight over Blue, then the Green receiver should take the out route deep enough to get behind the cornerback while the Red receiver will take the safety out of the area with the corner route. However, most defenses will play deeper with the corners which may result in the Green out route being covered. If both the inside receivers are covered, then the read falls short to the Blue receiver on the drag across the field. With a route like this, it’s usually better to wait until the receiver gets to the opposite side of the field. However, with a trips formation, the defense may have a defender on that side with no one to guard waiting on the receiver. In this case, the better option may be to throw the ball quicker on the trips side. On the receiver catches the ball, he should immediately break up the field or take the ball toward the opposite sideline at a 45 degree angle splitting the safety and conerback. The final option is an outlet to the Center (Black) on the hook. 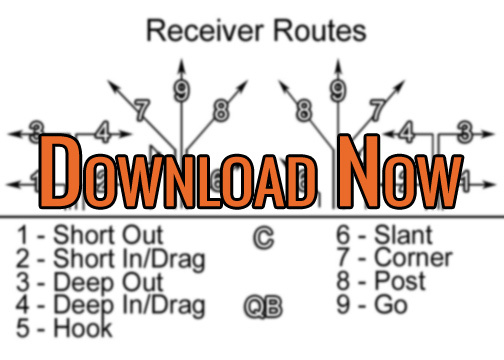 The Center’s route is not just “go 5-7 yards and hook”. He should find an open area in the middle the field without going too deep, but deep enough to get out of the Blue receiver’s way. This may mean the Center takes the route a few yards off center. The read needs to be quick. The quarterback should recognize if the Corner and Out route are covered and quickly move to the shorter outlet routes. In the pre-snap, you can help the quarterback out by reading the defense and call out the option that should be the focus. If the defense has 2 safeties and the corner is playing tight to the Blue receiver, then call out Slot, Green, Timmy, something to let the quarterback know that Slot receiver may be open and focus there for the first option. 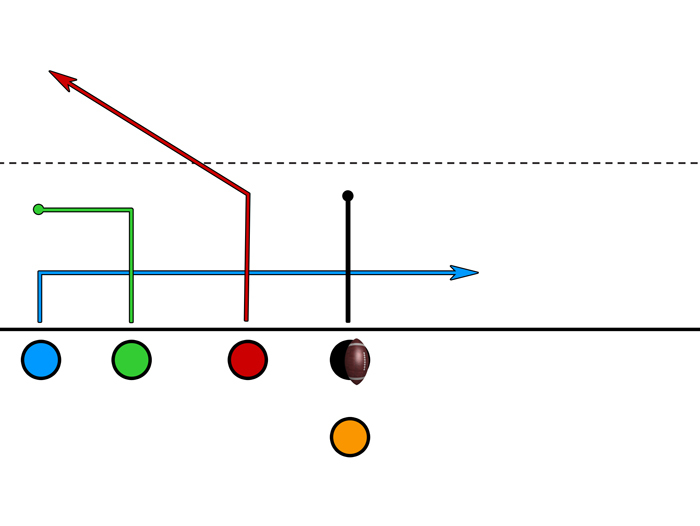 As mentioned above, the quarterback can throw to the Short Drag early in the route and the receiver can immediately turn up field before crossing in front of the center. Another variation would be to move all receivers closer to the center. The read becomes short to long where the quarterback looks to hit the Short Drag first, then the Deep Out, and finally, the Corner route. The center remains as the outlet receiver finding an opening spot in the middle of the field. Using a trips formation in flag football can result in open receivers if the defense does not adjust. One drawback though is that with 3 receivers on the same side, it can become cluttered and the defense may be position to make quick flag pulls once the ball is caught. Check out this other Trips play for another option in overloading one side of the field.